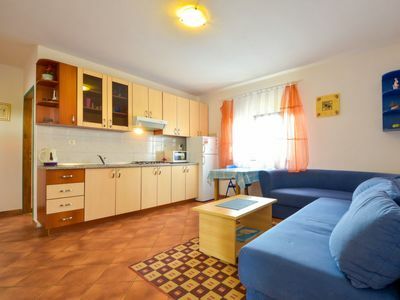 RENT A VILLA IN OPATIJA AND BE PREPARED TO BE SWEPT OFF YOUR FEET! 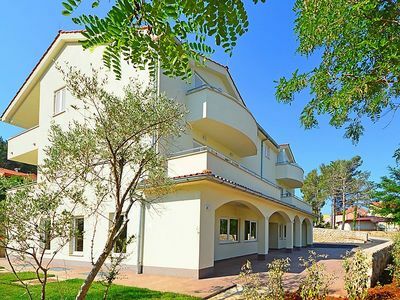 Whenever you have the need to pamper yourself and feel royal, first that comes to your mind should definitely be holiday in villas in Opatija. That's right! Our villas in Opatija count as a symbol of elegance, luxury and complete relaxation. Just imagine yourself sitting in the garden of a villa in Opatija, sipping a glass of your favourite drink or drinking your first cup of coffee in the morning on a terrace while overlooking the beautiful Opatija Riviera. It doesn't get any better than this! Opatija is famous for hosting all important festivals and events, therefore, once you step your foot into that gorgeous Mediterranean city, you can really feel the elegance. Opatija is situated in the Kvarner Bay, just beneath the mountain Ucka. You are also able to find numerous beaches around Opatija, where you can relax and enjoy the sun and the sea. After a long day of sunbathing and sightseeing, you should sit in one of many restaurants and taste the local cuisine. As you will see, all of this glamour made Opatija throughout history the most popular tourist destination and gave it the name “Pearl of the Adriatic”. Don’t miss this opportunity and book your villa in Opatija! This beautiful modern villa is nested on a hill side over a small medieval town of Lovran on the famous Opatija riviera. 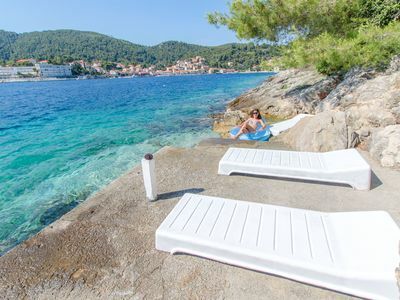 It boasts wonderful views of the Adriatic from the terraces and very private garden featuring an infinity pool. The location is excellent with all the amenities and the beach in short walking distance. Outside you will find an all fresco dining area, sun loungers and some nice lounge furniture to enjoy the views and the sun. Indoors there is a spacious open living area folded with light and opened to the garden. 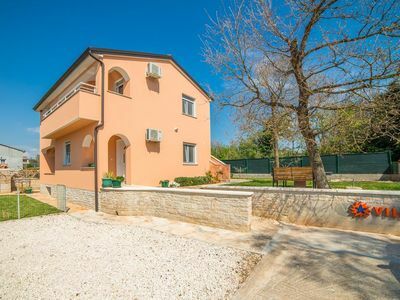 Villa Emily is a residential facility, built on three floors: basement, ground floor, first floor and attic with a swimming pool and Jacuzzi in the front of the house and an outside kitchen in back of the Villa. 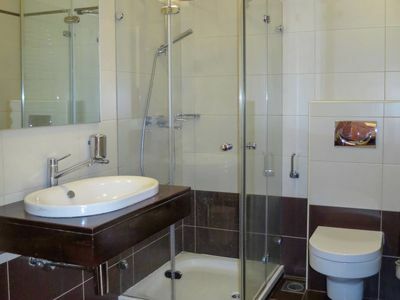 The house has, 3 bathrooms, 4 toilets, 5 bedrooms, 5 terrace, attic and it is fully air-conditioned. In the basement there is a tavern made in the antique style (stone, old brick, wooden beams. ), with a big fireplace, bathroom, and apartment with two sleeping beds and a sofa. There is also a wine cellar in the tavern with lot of vine that you can taste and drink if you like it. 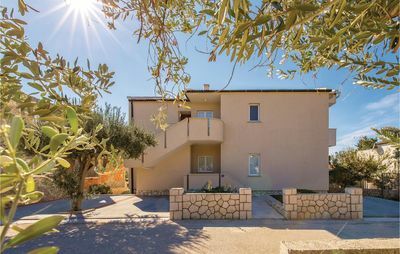 Internal stairs lead to the ground floor or first floor where there is a beautiful large living room with view on the Kvarner Bay with a fireplace, covered terrace, kitchen and dining room with access to the rear of the house to the terrace. On the first floor is also the main entrance on the side and a toilet. The rear terrace behind the kitchen and dinning room is equipped with a big large table so you can sit outside and enjoy your morning breakfast, launch or dinner. 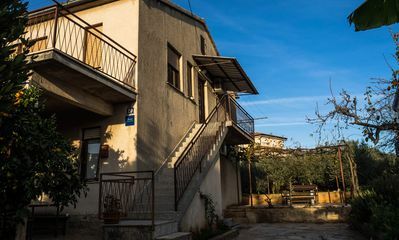 Also over the rear terrace on the hill is covered outside kitchen with a big fireplace where you can prepare your favorite meals outside in the nature, surrounded by beautiful garden with lots of flowers, palms and green wood. 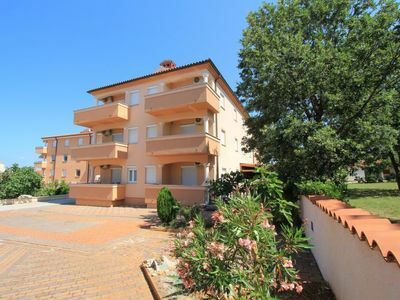 From this point you have also a beautiful view on the swimming pool and Kvarner bay and City of Rijeka which shines at nights giving you a wonderful feeling and a great view. This place is a place where you will for sure enjoy your stay in Villa Emily. 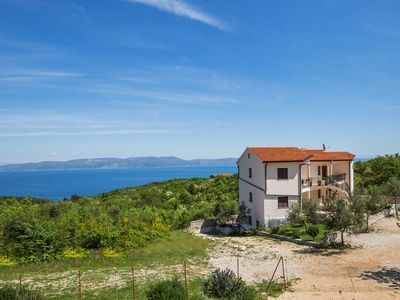 Imagine yourself staying outside on the fresh air, with a fireplace burning, drinking a glass of homemade vine or a glass of cold beer, overlooking the Kvarner bay and City of Rijeka while the music is playing your favorite song. This is something you can just imagine but you can feel it in Villa Emily. Internal stairs lead to the second floor where there are three large bedrooms and a large bathroom. Each room is decorated in a unique cozy style, like Lover's room in violet colour, or Paris room in red and grey, or Emily's master room with it's own private bathroom with a terrace and view on the sea. 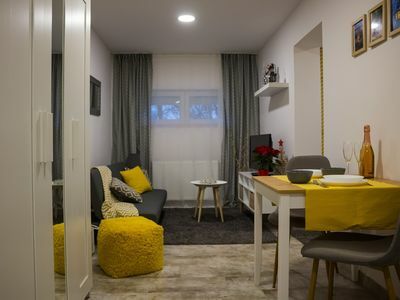 Emily's room, the main room (let's call it a family) is the size of 24 m2 and has a shaded terrace and the room (literally out of bed) has a magnificent view of Kvarner bay and the city of Rijeka that shines all night. This family room has it’s own private bathroom inside the room. The other two rooms have also a double bed and this floor is fully air-conditioned so you can sleep confortable in the hot summer nights. In the attic is a small studio with big double bed, perfect place for kids to play. The loft has two skylights and a large window on the side. A skylight above the staircase is located, so all day illuminates the entire interior staircase, and there is also a second window with a beautiful view of the sea, city of Rijeka, marina Icici, the island of Krk, etc. 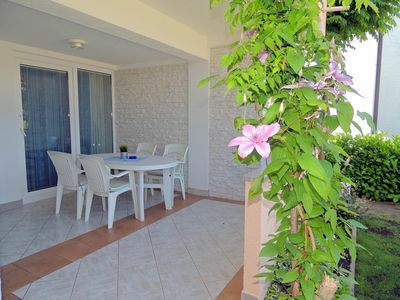 On each floor there are wonderful large covered balcony overlooking the entire Kvarner bay and Adriatic sea. The house is situated in a peaceful location with beautiful sea views and surrounded by greenery and overlooking Lovran chestnuts. The garden is well tendered with lots of green trees, flowers, palms, and green grass, making your stay more confortable. 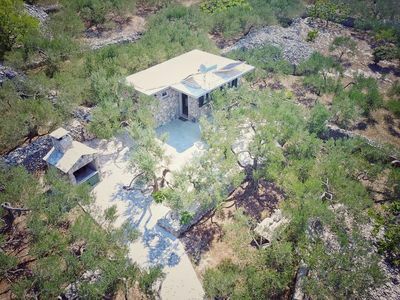 In the garden (in the back terrace) is outdoor summer kitchen with two large fireplaces (on wood and gas) where you can prepare your favorite meals and enjoy your breakfast, lunch or dinner in peace and discretion surrounded by greenery and Lovran chestnuts. Interior of the house is completely decorated with beautiful pictures from famous academic painter Claudio Frank. The house has parking space for approximately three vehicles. Fence around the house is made from iron, green trees and stones. 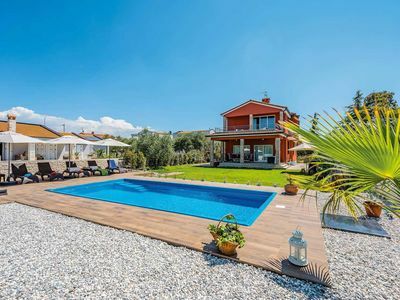 In front of the house, in the garden there is a big swimming pool with a beautiful view on a sea and City of Rijeka and Kvarner bay, where you can enjoy swimming and relaxing in the pool drinking your favourite cocktail. The area around the pool is equipped with sun loungers and some nice lounge furniture to enjoy the views and the sun. There are also lots of palm trees around the swimming pool making you feel like you are on the beautiful beach. Close to the swimming pool is another terrace with a Jacuzzi and hidromasage where you can enjoy your stay in this massage pool and drink your favorite cocktail. So what is so Special about Villa Emily from the other places. -There is a cleaning women also at your disposal when ever you need it she will came and do her job. -The first day when you arrive I can make a barbecue for all of you so you can eat and drink as much as you want and can at a single price of 15 eur for a person. And I’m sure you will love this barbecue because it is made from home made staff, like meat, mushrooms, vegetables, all natural, and homemade vine. And that is just for a price of 15 eur per peson (kids under 10 years old don't pay). -And the last day when you leave I will or any other day when you want I can make also a diner for all of you but with fresh sea food like fresh fish and other sea specialties and a home made white vine that will taste so good that you will really remember this dinner. And this is for a single price of 20 eur per person (kids under 10 years old don't pay). -And if you need any other homemade things like vine, oliven oil, chees, bacon etc. I will get it for you. 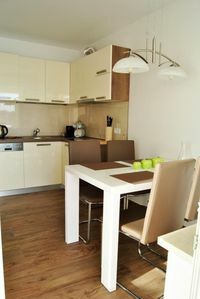 So I hope you will have an unforgettable holiday in Family Villa Emili.